The Fairmont Banff Springs Luxury Hotel - Opulence and seclusion meet beautifully at The Fairmont Banff Springs hotel. With unparalleled luxury in pristine wilderness, our Banff hotel offers a stunning retreat. Calgary Hotels - Lists over 80 hotels in Calgary which can be booked online. Luxury Lake Louise Hotel at The Fairmont - Nestled on the banks of Canada's most-famous lake, Chateau Lake Louise beckons visitors to a Lake Louise hotel with majestic views and luxurious accommodations. Jasper Accommodations - Guide to hotels in Jasper, Alberta, Canada, including lodges, resorts, cabins & chalets. The Fairmont Jasper Park Lodge Luxury Hotel - Nestled in the Canadian Rockies, the Jasper Park Lodge features charming cabins and lavish suites for the perfect Rocky Mountain lodge experience. Discover the beauty of our Jasper hotel’s surroundings. The Fairmont Hotel Macdonald - a Luxury Edmonton Hotel - Discover the elegance of The Fairmont's Edmonton hotel. With luxurious guestrooms and gracious service, the Hotel Macdonald sets the standard for Edmonton hotels. Edmonton Hotels - Find deals on over 60 hotels in Edmonton. The Fairmont Palliser Luxury Calgary Hotel - Discover the Palliser luxury hotel in Calgary, where small town warmth and a vibrant urban ambiance meet. With gracious service and luxurious rooms, the Palliser hotel is the ideal escape. Edmonton Marriott at River Cree Resort - is close to the airport and downtown Edmonton. This Edmonton hotel features complimentary shuttle to West Edmonton Mall, 3 restaurants, 2 NHL-sized hockey rinks, indoor pool, and fitness centre. 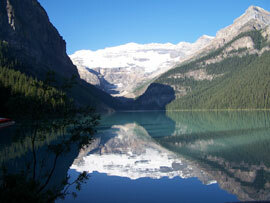 Banff Hotels and Accommodations - Discounted rates on Hotel rooms, Car Rentals, Flights, Vacation Rentals. Discountedhotels.com, your complete travel resource. South Edmonton Common - Edmonton’s power shopping centre and entertainment hot spot. Canadian Passenger Rail Services includes schedules, maps, info and operating details for passenger rail services in Canada. VIA Rail Canada Inc. -includes a complete interactive timetable of schedules and fares for domestic services.